I moved to Goshen in December 2014. My husband, Adam Scharf, is from here, and we were married in 2013. I’m originally from Winnipeg, which is an 18-hour drive mostly north and a little bit west. I run two businesses in Goshen. One is Blank Space Goshen, which is a downtown venue for events, meetings, and special occasions. It fulfills a niche for people who want to host a personal, private event, but not in their house. We’ve also worked a lot with local businesses. With Adam, I also co-run Red Tail Farm, our larger barn event venue. There, we specialize more in weddings and larger occasions. One of my hobbies is singing in the Notable Women choir. I’m also interested in wine and learning more about it. I get really jazzed up and can get pretty nerdy and geeky talking about it. Bringing wine bar and wine tasting nights to the community in Blank Space is a possibility I’d like to explore. Having a small child (and another one on the way!) makes me appreciate all the green spaces available in Goshen. We live along the millrace, and having that as our backyard – that beautiful trail, that gorgeous waterway – and having all that outdoor space easily accessible by foot and by bike is vital to quality of place, in my experience. Another place that lifts me up is Embassy Coffee; I love what Chris May is doing there. I’m an avid foodie and I’m interested in quality beverages, so Common Spirits – when I’m not pregnant – is a very favorite hangout spot. I love being a business owner in downtown Goshen. I love being able to walk down the street or see friends at The Local or visit Keith and Ann at Found. There are also amenities close at hand, which makes running a small business very easy; I can park downtown and then do so much of what I need on foot. All our banks are downtown, and I can go to John Hall’s True Value Hardware and buy whatever I might need for maintenance. 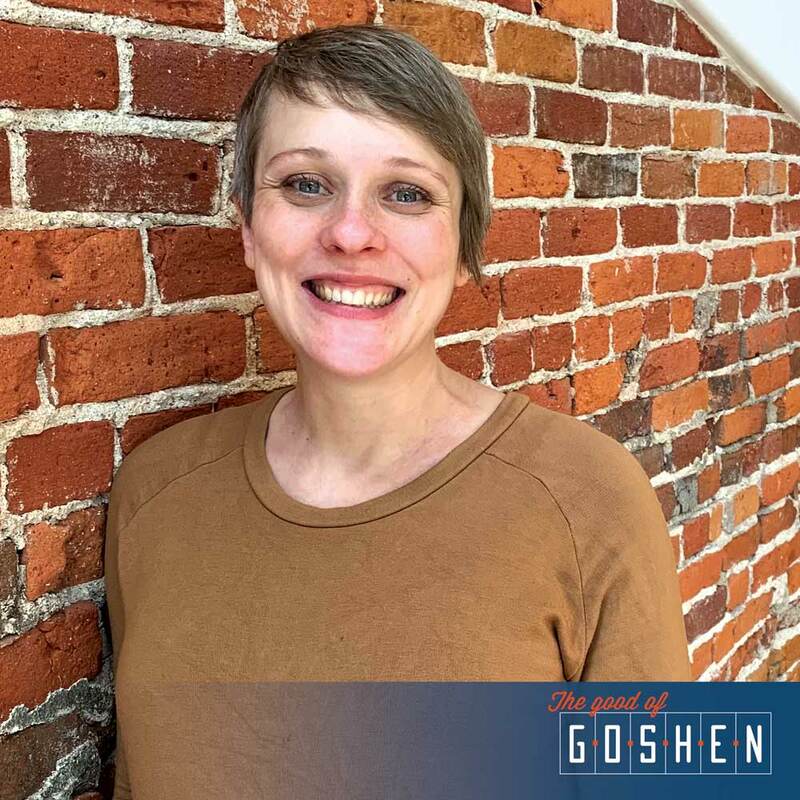 Goshen is certainly a positive place to live and work. I went from living in a city of 700,000 people to 34,000, and there are things I miss about a larger city. However, the core, crucial basics of what you want in terms of a community to live and work, Goshen has in spades. That includes a supportive small business entrepreneurial community that has a strong downtown business core, but also vibrant downtown programming. There is vibrant stuff happening downtown and not just from a business perspective, but also from an arts and cultural perspective – things like First Fridays, Arts on the Millrace, and Encuentro in the Alley. There is a lot going on here for seemingly such a small place.